Donald Wemhoff of Humphrey won $238,000 playing Nebraska Pick 5 from the Nebraska Lottery. Wemhoff purchased his winning ticket from Super Saver #18, at 3318 23rd St. in Columbus. The quick pick ticket contained one play with the winning numbers (01, 16, 23, 28, 31) from the July 5 drawing. 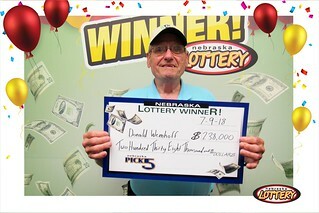 While claiming his prize on July 9, Wemhoff told Nebraska Lottery officials that the winning Lotto ticket was a free ticket he’d had won from a previous drawing. Wemhoff said that he didn’t realize he’d won until he was reading the Norfolk Daily News and checked the winning numbers. “I looked at my wife and said, ‘These look the same numbers as the ones on this ticket,” he said. Wemhoff kept the ticket tucked in a safe until he could get to the Nebraska Lottery offices in Lincoln on Monday. He said he’ll use the money to make his retirement a little more enjoyable.